Have you ever wondered what makes German chocolate cake German, given that its key ingredients (cocoa, coconut, and pecans) aren’t grown in Germany? It turns out the cake isn’t named after the country, but rather (in a roundabout way) after a guy: Samuel German, an American chocolatier who in 1852 developed a formulation of dark chocolate for baking that came to be known as Baker’s German’s Sweet Chocolate. The recipe for the chocolate layer cake with a coconut-pecan filling was created by a Mrs. George Clay of Dallas, Texas in 1957, and published in the Dallas Morning Star. 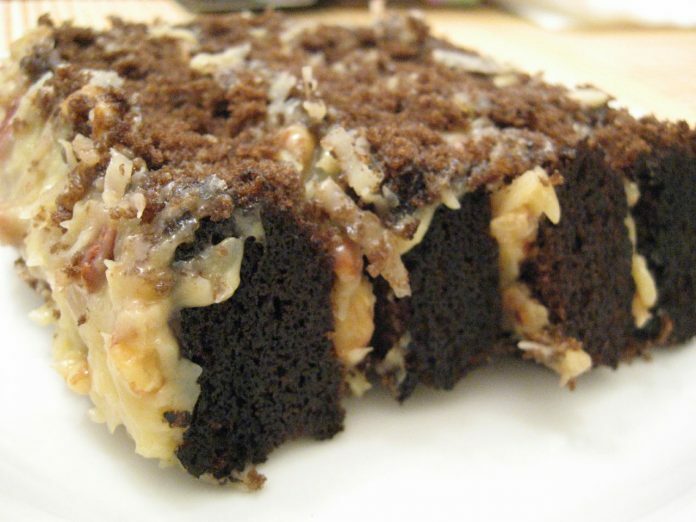 Because the recipe used German’s chocolate, it was originally called “German’s Chocolate Cake,” but the name was later shortened to remove the possessive, creating the misleading impression that it was named after a place. But Germany isn’t quite off the hook when it comes to chocolate cake. We’ll talk about Black Forest cake another day.